On Thursday, October 5, the Moksha Arts Collective presents the next installment of the Moksha Lecture Series featuring visionary painter Mark Henson along with author and film maker Michael “Zappy” Zapolin. The Moksha Lecture Series is a unique educational forum that offers insight and historic perspectives of culture and the visionary luminaries within. Over the years, these lectures have explored elements of science, history, the environment, indigenous culture, health care and other dynamic topics. Past speakers have included Dr. Dennis McKenna, Daniel Pinchbeck, Dr, Manny Torres, Dr. Joe Tafur, Dr. Dennis Wiedman, Barbara Harper RN and other noted scholars. Now as a non-profit organization, we are preparing to expand our programing and continue to reach out into the community. Mark Henson will discuss the impact of psychedelic imagery of the 60’s Haight-Ashbury scene and show how those elements are still reflected in today’s style. “Summer of Love – 50 Years of Changing the World through Art” will highlight the creative fusion of art, music, underground culture and politics expressed though posters and street art. Mark will share his personal influences and experiences with selected pieces and the artists who created them. By following the patterns set by these artists, we can see how their styles continue to resonate in modern advertising, political propaganda and visionary art of today. Michael “Zappy” Zapolin will present his film “The Reality of Truth” and discuss some of the process developing the project. Zappy was a tech pioneer who revolutionized search engines and web domains. He is the creator of the eBusiness elective offered at Harvard Business School. Zapolin is currently the CEO of Zappy Incorporated, a cannabis development company. The film depicts the insights of gurus, entrepreneurs, and celebrities including Deepak Chopra, Michelle Rodriguez and others inspired by natural medicines. In the documentary, Zappy explores the range of mediums to expand consciousness through plant medicine, yoga, meditation and other modalities. Both speakers will answer questions and interact with the audience after their presentations. By providing the platform for cultural development, the Moksha Lecture Series offers an opportunity to learn from the experiences of these innovators. Join us as we kick off the upcoming season and lead into Moksha Art Fair 2017! We are premiering the induction of the artwork of Mark Henson into The Moksha Virtual Gallery. VR gallery designed by Juan Carlos Gallo. 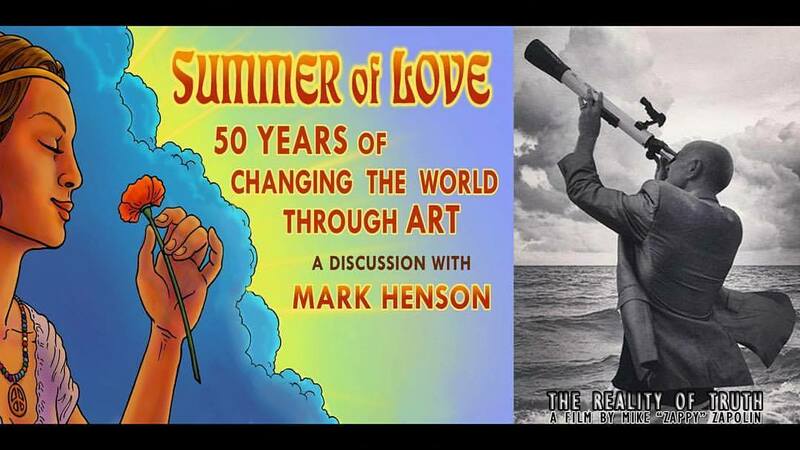 In addition we will be auctioning off an original Summer of Love poster from Mark Henson’s personal collection..
Come early for refreshments and snacks from the Plaiedean Lounge.